Over the next several mornings – February 7 to 9, 2018 – you’ll find the moon moving past the planets Mars and Jupiter. 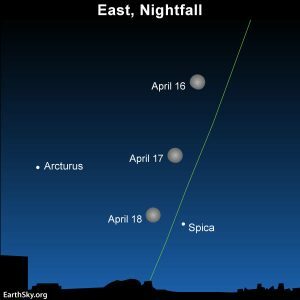 On the mornings of February 7 to 9, 2018, early risers can watch the moon as it moves in its orbit past the planets Jupiter and Mars in Earth’s predawn sky. Look generally southward before sunup from the Northern Hemisphere (northward, or high overhead, from the Southern Hemisphere). 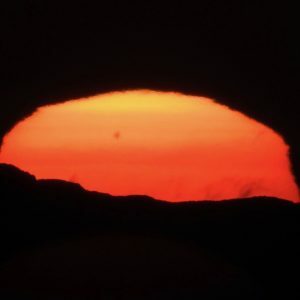 Mars rises later at night, closer to the time of sunup, but night owls will find Jupiter climbing above the eastern horizon in the wee hours after midnight around now. If you’re out very late with someone special, you’ll enjoy pointing out Jupiter, which – since Venus is in the sun’s glare – is the brightest starlike object in the night sky this month. After rising in the east, Jupiter climbs upward until soaring highest up for the night at roughly 6 a.m. local time (that’s the time on your clock as seen from around the world). Around now, both Jupiter and Mars are well placed for viewing before dawn’s light washes the sky. Click here for recommended almanacs; they can help you find the exact rising times for the moon and planets into your sky. The moon is at or near its last quarter phase around February 7. Read more about the last quarter moon. 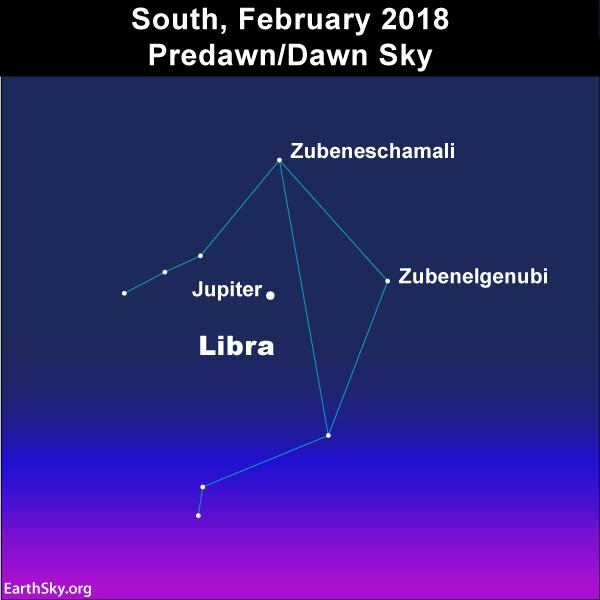 Let Jupiter be your guide to the constellation Libra and its two brightest stars, Zubenelgenubi and Zubeneschamali. In February 2018, Jupiter is shining in front of the constellation Libra the Scales. You might – or might not – see Libra’s two brightest stars, Zubenelgenubi and Zubeneschamali, in the glare of the moon. 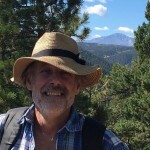 But once the moon moves by Jupiter after a few more days, you can use Jupiter to find Libra’s two modestly-bright third-magnitude stars for months to come. Jupiter and the constellation Libra’s stars rise about four minutes earlier daily and one-half hour earlier weekly. So in another few months, you can look forward to seeing Jupiter and the constellation Libra in the evening sky well before your bedtime. Jupiter’s opposition – when Earth will pass between this outer planet and the sun, marking the middle of the best time of year to see it – will come on May 9, 2018. Sky chart of the constellation Libra the Scales via IAU (International Astronomical Union). And Mars? It’s the planet to watch in 2018, and it’s shining at the border of the constellations Scorpius and Ophiuchus in early February. Contrast its brightness with the red star Antares – brightest star in the constellation Scorpius the Scorpion – in early February. Then look again in late February. Mars is brightening fast now and might outshine Antares, by a hair, by late February. In 2003, Mars was closer and brighter in our sky than in nearly 60,000 years. Around its late July 2018 opposition, Mars will be at its brightest since then! Let the moon guide you to Mars on these February mornings so that you can start watching Mars now. Click here to read more about Mars. 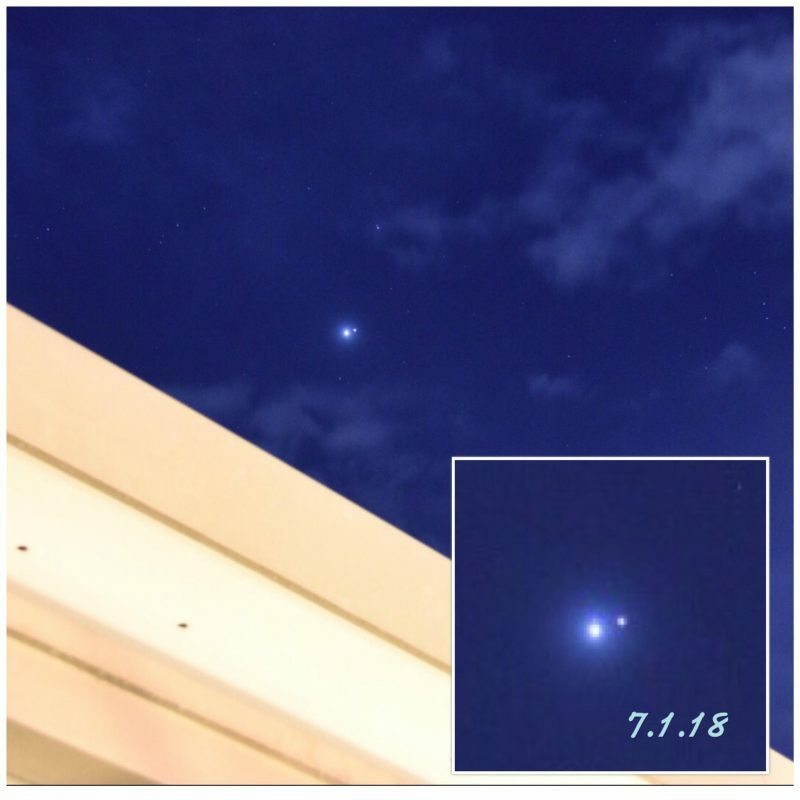 Brighter Jupiter, fainter Mars, on January 7, 2018, via Jenney Disimon in Sabah, North Borneo. More photos of the January 7 conjunction here. Jupiter will remain steady in brightness. Mars will brighten dramatically, to outshine Jupiter and reign as the 4th brightest object in Earth’s sky – after Venus, the moon and the sun – from about July 7 to September 7, 2018. Night by night, as we stand on Earth’s surface watching the moon, we can see it shift its position in front of the fixed stars and wandering planets. This motion is due to the moon’s actual motion in orbit around Earth. The moon takes about a month (one moonth) to orbit the Earth. Although the moon rises in the east and sets in the west each day (due to Earth’s spin), it’s also moving eastward through the constellations of the zodiac due to its orbital motion. The moon’s orbital motion can be detected in the course of a single night, but you have to watch the moon closely, with respect to stars in its vicinity, over several hours. The moon’s eastward, orbital motion is easiest to notice from one day (or night) to the next. The moon moves – with respect to the fixed stars – by about 12 to 13 degrees each day. The planet Saturn is also up before dawn. You’ll see the moon closing in on Saturn beginning around February 9 or 10, and closest to Saturn on February 11. Bottom line: Over the next several mornings – February 7 to 9, 2018 – you’ll find the moon moving past the planets Mars and Jupiter. Mars rises later at night, closer to the time of sunup, but night owls will find Jupiter climbing above the eastern horizon after midnight now, highest in the sky around dawn.